You can’t live in New Hampshire, or the Northeast for that matter, and not find someway to embrace the winter season. If you are not able to fathom a way to enjoy the outdoors during this seemingly, at times, endless succession of day after day of cold temperatures and sometimes biting winds and snow, you will struggle to see any chance for spring, never mind have a vision for summer. But out of the darkness…light! If you look outside on a beautiful sunny winter day and notice just how blue the sky can be and how the light twinkles and reflects in the snow, you can begin to see amazing images only visible in winter. And then if you step outside (properly layered of course) and feel the tingle of cold air on your face, then you can really know how truly alive your senses can be this time of the year. The trick is to find a way to stay active and look forward to being able to participate in the season by enjoying an entirely different kind of view. I’ve always enjoyed hiking. Living so near the mountains and lakes I’ve gotten spoiled with easy access to the great outdoors, the scenery, and the natural visions you encounter along the way. And I have been able to continue my need for fresh air, exercise and beautiful scenery in the winter by settling into a pair of snowshoes and traveling along some of the very same paths I use the rest of the year. 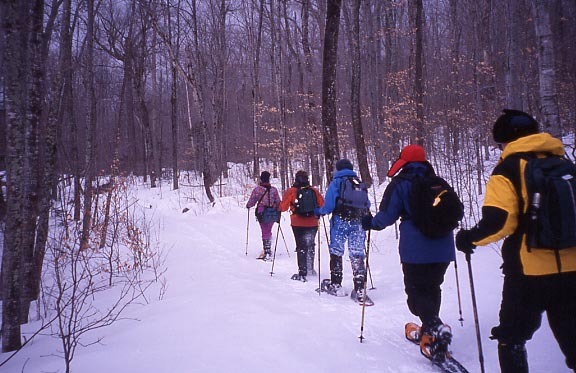 Snowshoeing is one of the oldest known methods of transportation. It is a sport that is also easy to accomplish. Probably the biggest learning curve is actually putting on the snowshoes. Other than purchasing the snowshoes themselves there is also minimal costs associated with the sport. In addition, you have the added benefit of moderate aerobic exercise depending on the amount of energy you want to expend. I don’t know too many folks that don’t want to maintain or improve their cardiovascular fitness even just a little. Snowshoeing can accommodate a variety of fitness levels and can be enjoyed for a half hour walk or an all day adventure if you carry a backpack with water and lunch! It’s that simple and easy and a great way to get out and enjoy the peaceful serenity and quiet of the forest in winter. Watching and listening for birds, identifying the animal tracks in the snow and taking in scenery you would completely miss sitting inside all day. Some of my favorite hikes are close by. I’m sure others reading this would have even more suggestions for favorites and we’d love to hear about those places as well! For some easy and accessible snowshoe hikes warranting just a short drive I’ll offer a handful that I have fun on. If you want a bit of a more vertical snowshoe challenge with the payoff of brilliant views, head up West Rattlesnake via the ‘Old Bridle Path’ off of Route 113 in Holderness. At just under a mile one way to the 1260-foot summit, you’ll enjoy a nice workout and have some of the most incredible lake and mountain views in the Lakes Region. The Chamberlain-Reynolds Memorial Forest is another popular trail system with a different viewpoint for nature. The Squam Lakes Association manages this beautiful forest consisting of an approximate 3.5-mile trail network, which crosses a wetlands boardwalk and proceeds eventually down to the shore of Squam Lake. A more gentle type of terrain, this snowshoe hike is quite popular and easy to access just off College Road on Route 3 between Meredith and Holderness. The Hamlin Recreation and Conservation Area in Meredith is approximately a 159-acre tract of forest and views offering possibilities for much longer snowshoe hikes if you choose to meander the various trails options. There are basically 3 trail choices with lengths varying from 1.6 miles to 5.5 miles with a diversity of terrain changes and offering some beautiful mountain and lake views and overlooks along the way. This conservation area, managed by the Meredith Conservation Commission is located off Chemung Road accessed by Meredith Center Road. And lastly, I offer the Waukewan Highlands Trails, an interpretive trail system managed by the Town of Meredith in cooperation with the Lake Winnipesaukee Watershed Partnership and the Winnipesaukee Watershed Corps. This beautiful natural area is a combination of open fields, forests, a pond and brief boardwalks to navigate wetlands areas (frozen in the winter). Parking is located off Route 106 as you head from Meredith to Laconia. There are 3 trail options or you can combine them all for a total of approximately a 2.7-mile tour. Remember to look, listen and enjoy while you’re out in the forest snowshoeing as winter has its own secrets to reveal. And if you have other great ideas for a snowshoe expedition we’d love to hear about it! This entry was posted on February 3, 2011 at 4:05 am and is filed under Area Events. You can follow any responses to this entry through the RSS 2.0 feed. You can leave a response, or trackback from your own site.